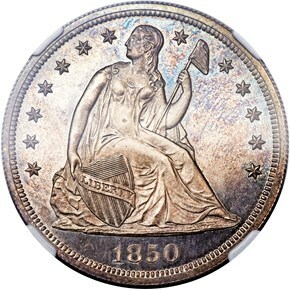 Proof 1850 dollars were struck with two distinct obverse die types: the first marriage combines a Closed 5 obverse with a new reverse die that was not used to produce any of the earlier proofs in this series. The Mint also used these dies to produce business strike 1850 Seated dollars of the Closed 5 variety. 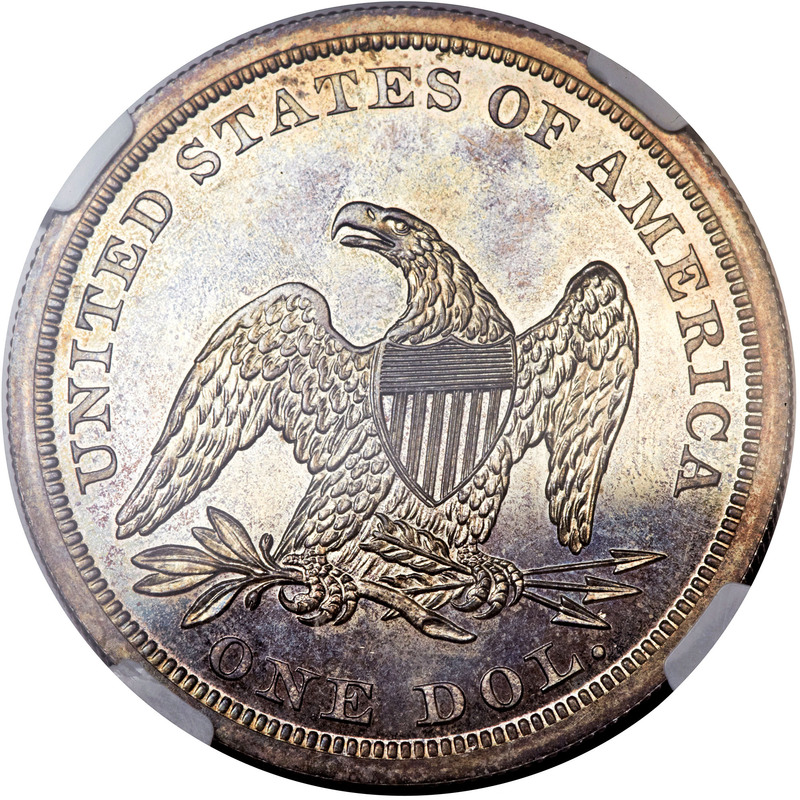 The second marriage combines an obverse that is identifiable by an Open 5 in the date and repunching on the base of the 0 with the same reverse used to produce most proofs of the 1840-1850 era (two defects at the right side of the final A in AMERICA). This Open 5 obverse also shows prominent die file marks that extend slightly upward and to the left from the denticles below 50 in the date. Apparently, the Mint struck a limited number of proofs with this die combination before using the obverse die to produce business strike 1850 Dollars of the Open 5 variety. During business strike production, the die cracked through the base of the date and was repolished. The die was re-mated with the same reverse die as before to produce more proofs, possibly at a later time. Breen suggests that some of the proofs of this die state may be restrikes, but evidence is not conclusive. 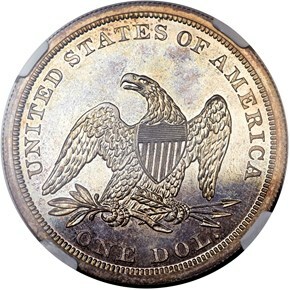 David Bowers, in his book Silver Dollars and Trade Dollars of the United States, estimates that as many as 35 proof 1850 Seated dollars of all varieties and die states are extant, out of an original estimated mintage of between 40 and 60 pieces. 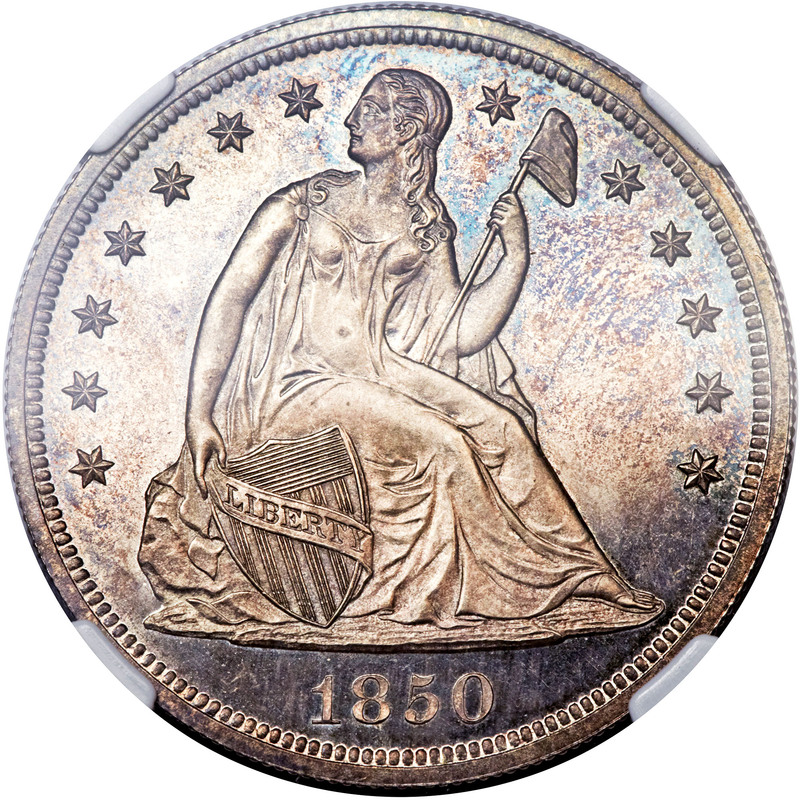 This issue is more available than most of the proof dates from 1840 through 1849, perhaps because a decent number of restrikes were produced to satisfy collector demand for the low mintage 1850 date.